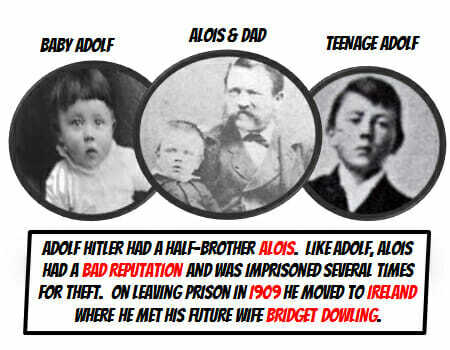 Adolf Hitler had a half-brother Alois. Like Adolf, Alois had a bad reputation and was imprisoned several times for theft. On leaving prison in 1909 he moved to Ireland where he met his future wife Bridget Dowling. 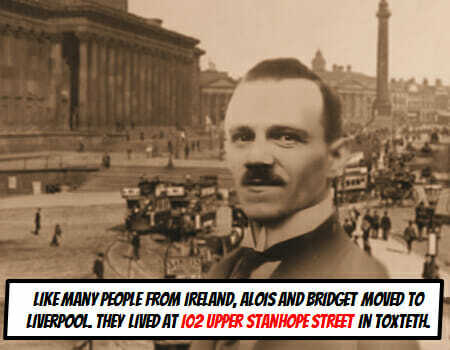 Like many people from Ireland, Alois and Bridget moved to Liverpool. They lived at 102 Upper Stanhope Street in Toxteth. Alois worked in Liverpool as a waiter. 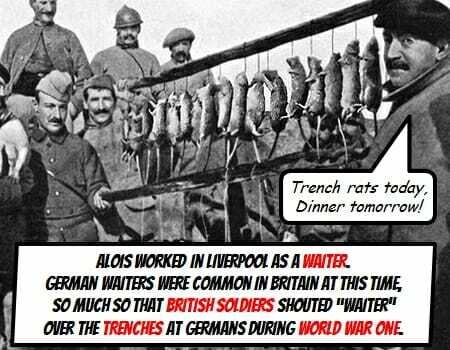 German waiters were common in Britain at this time, so much so that British soldiers shouted “Waiter” over the trenches at Germans during World War One. 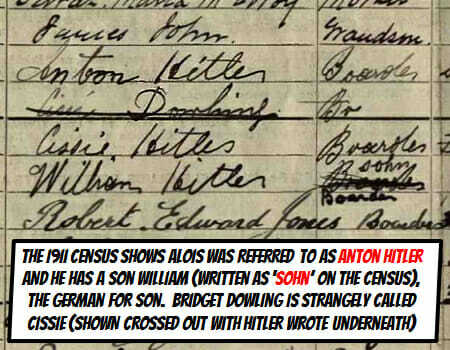 The 1911 Census shows Alois was referred to as Anton Hitler and he had a son (written as ‘sohn’ on the census), suggesting that Alois wrote this himself. 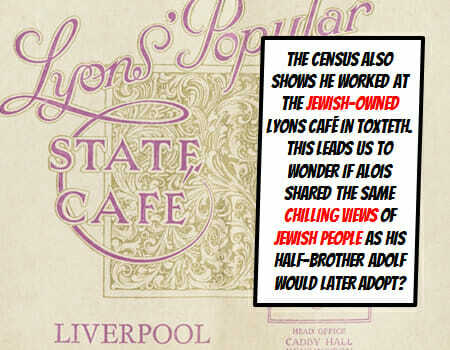 The census also shows he worked at the Jewish-owned Lyons Café in Toxteth. This leads us to wonder if Alois shared the same chilling views of Jewish people as his half-brother Adolf would later adopt? 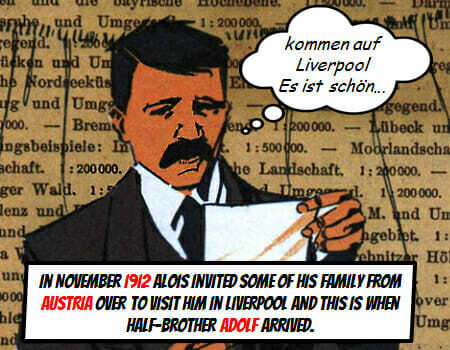 In November 1912 Alois invited some of his family from Austria over to visit him in Liverpool and this is when half-brother Adolf arrived. 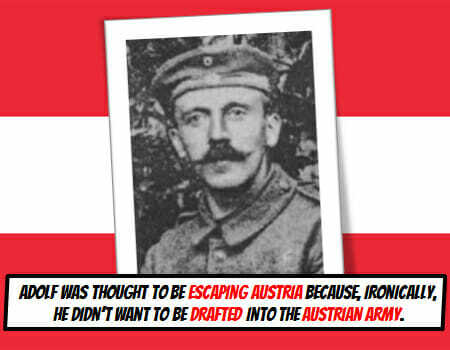 Adolf was thought to be escaping Austria because, ironically, he didn’t want to be drafted into the Austrian army. 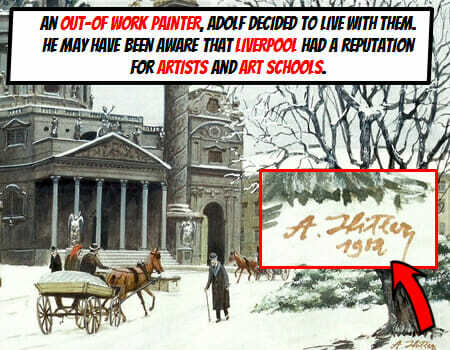 An out-of work painter, Adolf decided to live with them. 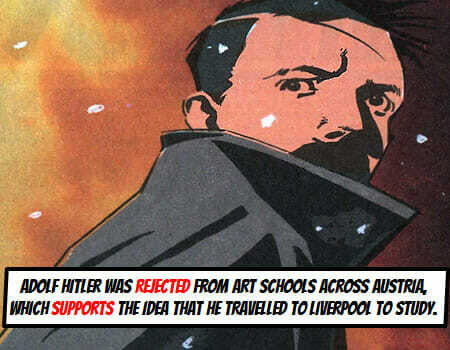 He may have been aware that Liverpool had a reputation for artists and art schools. that he travelled to Liverpool to study. 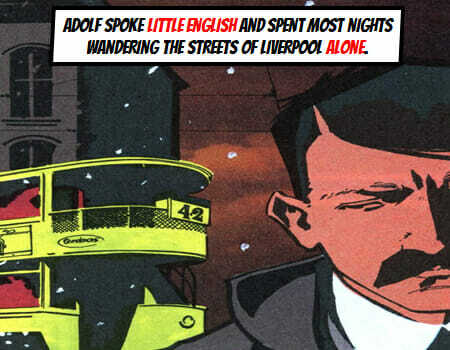 He spoke little English and spent most nights wandering the streets of Liverpool alone. 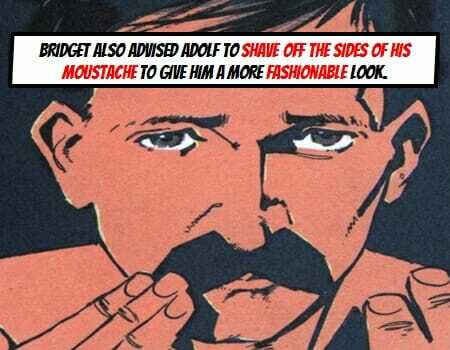 It is thought that Bridget not only advised Adolf to shave off the sides of his moustache, but that she also introduced him to Astrology which he later became fascinated with. 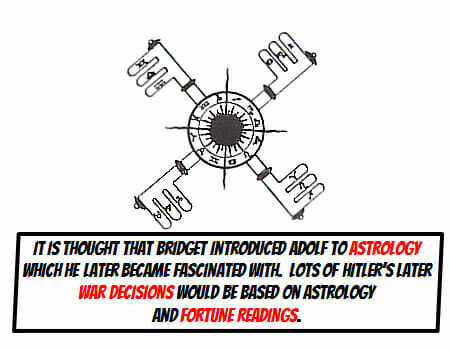 Lots of Hitler’s later war decisions would be based on astrology and fortune readings. 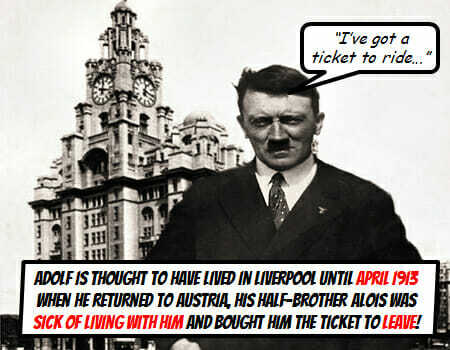 Adolf is thought to have lived in Liverpool until April 1913 when he returned to Austria, his half-brother Alois was sick of living with him and bought him the ticket to leave! Soon after, Alois left his wife Bridget and returned to Germany. 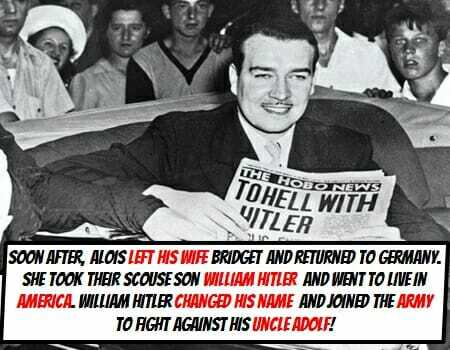 She took their scouse son William Hitler and went to live in America. William Hitler changed his name to Houston and joined the Army to fight against his Uncle Adolf! 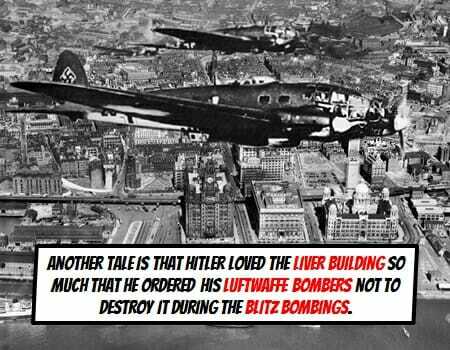 The Hitlers’ old Liverpool home was ironically destroyed by German bombers in January 1942. 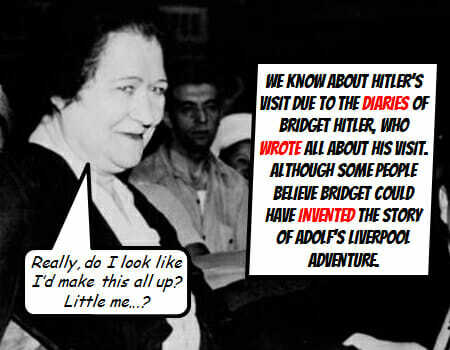 We know about Hitler’s visit due to the diaries of Bridget Hitler, who wrote all about his visit. Although some people believe Bridget could have invented the story of Adolf’s Liverpool adventure. 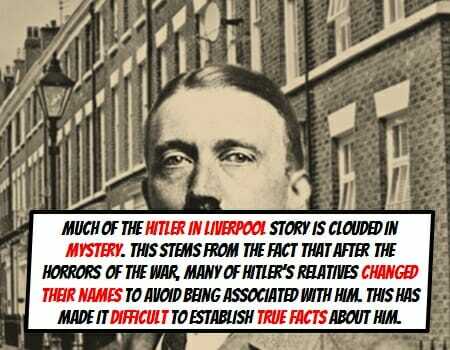 Much of the ‘Hitler in Liverpool’ story is clouded in mystery. This stems from the fact that after the horrors of the war, many of Hitler’s relatives changed their names to avoid being associated with him. This has made it difficult to establish true facts about him. 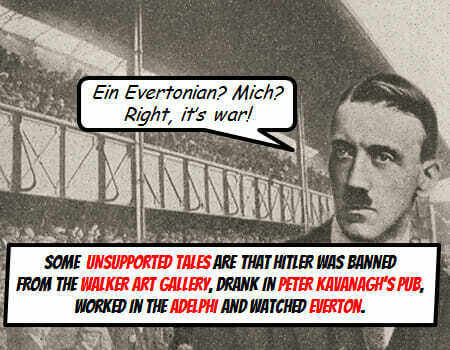 Some unsupported tales are that Hitler applied to study Art at Liverpool (and was rejected), was banned from the Walker art Gallery, drank in Peter Kavanagh’s Pub, worked in the Adelphi and watched Everton. Another tale is that Hitler loved the Liver Building so much that he ordered his Luftwaffe bombers not to destroy it during the Blitz bombings. World War II, World War 2, Liverpool World War II, Liverpool Blitz, Liverpool Evacuees, Evacuation, Hitler in Liverpool, Liverpool in War, Liverpool second world war.